Four Pillars Bloody Shiraz Gin is a popular Gin available from Amazon.co.uk in 70cl to buy online. Visit Amazon.co.uk for the best price for 70cl of Four Pillars Bloody Shiraz Gin or compare prices on our other Gin products. Aromatically it has fresh pine needles, citrus and spice, and a clear peppery, dense raspberry character. The palate is lovely and sweet with a long juniper and spice character on the finish. Recently featured in The Sunday Times Magazine, Bloody Shiraz is a sweet, purple elixir that is steeped for eight weeks with freshly picked shiraz grapes, this near full strength gin (37.8% abv) is sweet and luscious and unlike anything on the world gin market. In Australia, the entire production sold out in two months. 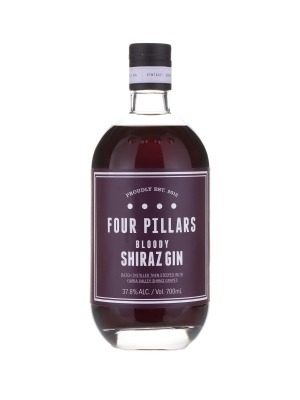 Where to buy Four Pillars Bloody Shiraz Gin ? Four Pillars Bloody Shiraz Gin Supermarkets & Stockists. You can buy Four Pillars Bloody Shiraz Gin online in most retailers and find it in the Gin aisle in supermarkets but we found the best deals online for Four Pillars Bloody Shiraz Gin in Amazon.co.uk, DrinkSupermarket.com, TheDrinkShop, and others. Compare the current price of Four Pillars Bloody Shiraz Gin in 70cl size in the table of offers below. Simply click on the button to order Four Pillars Bloody Shiraz Gin online now.